God always needs to be our go-to guy when it comes to counsel. Our first call. But the Bible also gives us the directive to connect with other Christ followers for guidance: seek godly counsel. “The LORD gives wisdom; from his mouth come knowledge and understanding. He holds success in store for the upright, he is a shield to those whose walk is blameless” (Prov. 2:6–7). When I make an effort to seek godly counsel, I benefit from the power of the Lord that is at work in the lives of those around me. I benefit from their mistakes and from their successes. And it frees me from the pressure of having to figure everything out on my own. It frees me to move forward beyond my own limited experiences, faith, and knowledge. Struggling with a tough work situation? Tangled up in a messy marriage knot? Are you being held captive by fear, doubt, and insecurity? Get some godly counsel. Proverbs tells us, “Without counsel plans fail, but with many advisers they succeed” (15:22 ESV). My husband is a wise man, and God has placed him as the head of our home, so I like to talk through difficult things with him. He gives me a perspective that’s often quite different from mine. When I need to hash out confusion, I sometimes go to the small group of women I call my besties. They are godly. They love me. They like me. They laugh at and with me. They pray for me. They mentor me and provide counsel. We’re all in different seasons of life and have different needs for godly wisdom. I am a poppy, you are a rose, she is a daisy—we are a wildflower bouquet! If you’re single, divorced, or widowed, you might be the head of your home. If so, you could connect with a pastor for godly counsel, or a trusted friend who follows hard after Jesus, or a godly family member or coworker. Another person I encourage you to reach out to is the women’s ministry director of your church. Grab coffee or lunch with her. She will love you! There are many ways you can gain wisdom and add greater power to your life. Add to this list as you discover what works for you. Are you a journal girl? Write about the areas in which you need God’s wisdom. Write a prayer in your journal that spells them out in black and white. Pursue the treasure! And here’s a wonky twist: sometimes God answers our prayers for wisdom by sending us to talk with someone who doesn’t even follow Him but has the knowledge we need. When our son Preston broke his jaw and needed reconstructive surgery, Brad and I got counsel from a highly trained oral and maxillofacial surgeon. We prayed for the Lord to lead each decision we made and to guide the hands and choices of the surgical team, but our medical counsel came straight from the medical expert. His faith had nothing to do with it. Though that medical advice may or may not have come from a follower of Christ, Brad and I prayed for the Lord to lead with His wisdom in, on, and through it all. God’s Word promises that He will walk you to the understanding you need. Just ask. I know you want His leading as much as I do. So when life gets crazy confusing, remember that you can gain clarity and power when you surround yourself with godly people of wise counsel. Dear Lord, You are the source of all the wisdom I ever need. Thank you for using others in my life to influence my success. Please help me grow in and welcome godly counsel. Name three people you know who give godly advice. Thank them today. Are you that person to anyone else? If this topic is a wake up call because you find yourself with very few godly friends, spend some time in prayer about this. Then search some out. For more discussion on today’s topic, join the conversation on my blog! 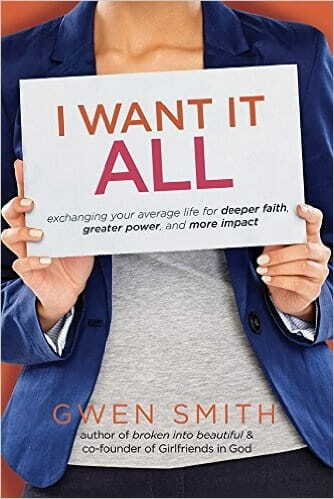 Today’s devotion is an excerpt from Gwen Smith’s new book, I Want It ALL, which is now available for pre-order. This book helps narrow the gap between our average ordinary lives and the not-so-ordinary promises of God found in His Word. We are meant to be women of impact who expect great things and move in the power and grace of Jesus. That’s the message of I Want It ALL. Pre-order yours today from Amazon, Barnes & Nobleor ChristianBook.com.